For other uses, see Lovers Lane. A lovers' lane is a secluded area where people kiss, make out, or sometimes engage in sexual activity. These areas range from parking lots in secluded rural areas to places with extraordinary views of a cityscape or other feature. "Lovers' lanes" are typically found in cultures built around the automobile—lovers often make out in a car or van for privacy. Lovers' lanes have existed for centuries, sometimes as places for secret meetings with a loved one or as a euphemism for red-light districts and other areas of prostitution. The Oxford English Dictionary records use of the phrase "lovers' lane" from 1853. 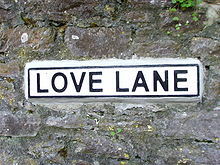 Road sign for Love Lane in Marldon, Devon, United Kingdom. There are several streets called Lovers Lane, including those at Oriskany, New York; Whitmire, South Carolina; Manitou Springs, Colorado; Baton Rouge, Louisiana; Kersey, Pennsylvania; Boonville, New York; Greenfield, Massachusetts; Southborough, Massachusetts; Northfield, Vermont; Riverton, Utah; Steubenville, Ohio; Bowling Green, Kentucky; Portage, Michigan; Excelsior Springs, Missouri; Springfield, Missouri; Charlestown, New Hampshire; Sugar Hill, New Hampshire; Princeton, New Jersey; Slatington, Pennsylvania; Adliya, Bahrain; Dallas, Texas; Texarkana, Texas; Ravenna Township, Portage County, Ohio; Visalia, California; El Segundo, California, Milwaukee, Wisconsin; Ancaster, Ontario, Canada; Newark-on-Trent; Ludham (both in England) and Thurso, Scotland. The area on the south-east side of Fullers Bridge, which crosses the Lane Cove River, and is located near Chatswood, New South Wales, Australia, is a well-known Lovers' Lane. Lovers Lane is a famous road in St. Joseph, Missouri of which a popular poem by Eugene Field was written. Lovers' Lane is most often in the urban legend "The Hook". The bowdlerised version Love Lane is sometimes seen. Jowett Walk, Oxford, once had this name. In 1963, a lovers' lane site at Fuller's Bridge, Sydney became notorious as the location of the bodies of CSIRO scientist Dr. Gilbert Stanley Bogle and Mrs. Margaret Olive Chandler, the wife of one of his colleagues. The cause of death, while indicative of poisoning, couldn't be definitively determined, and apart from Mrs. Chandler's husband, Geoffrey, who was considered the prime suspect by the New South Wales Police, no one to-date has been charged. The Bogle-Chandler case has baffled law enforcement and forensic experts up to present day. Several of the Zodiac Killer's victims were murdered in lovers' lanes in northern California. Several attacks perpetrated by the Son of Sam serial killer also took place in such settings. Two Mercer University students were killed by Andy Cook at a lovers' lane location in Georgia on January 2, 1995. ^ "Google Maps". Maps.google.com. Retrieved 2017-07-07. This page was last edited on 8 April 2019, at 03:43 (UTC).